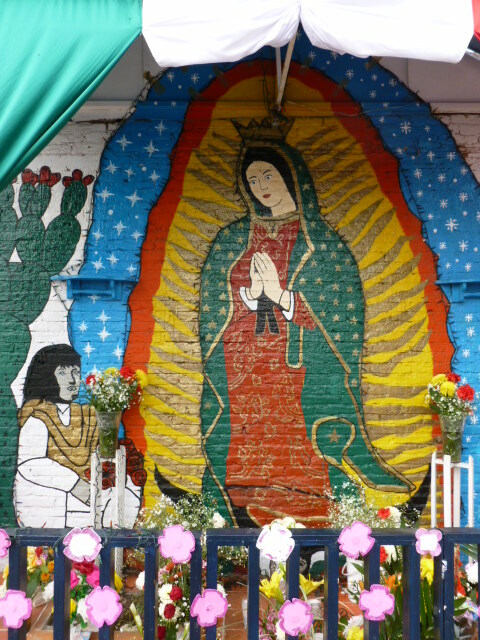 Could the enduring popularity of the name Guadalupe – “Lupe” or “Lupita” for short – have something to do with the grip of the Virgin of Guadalupe on Mexican spiritual consciousness? On my way back to San Luis Potosi from Aguascalientes last Wednesday, a phone conversation with a friend brought the news a Pope had been elected. After the news that the Argentinian Pope had chosen the name Francis I, I enjoyed listening to the banter on a talk radio show. It was one of those programs designed to lighten the mood of your morning commute and ease the work pressure at mid day. The conversation bounced around the question of whether the new Pope would be known in Mexico as “Francisco”, “Paco” or “Pancho”. Thanks to the presence of two “Francisco’s” in the Central Christian Church of San Luis Potosi, a “little Paco” and a “big Paco”, I had learned that two nicknames are used for the Spanish name “Francisco”. Thanks to the still powerful presence of Francisco “Pancho” Villa in Mexican culture, it takes a large personality to fill the shoes of a Pancho here. Paco I believe would be the nickname more likely for one aspiring to follow the example of the humble St. Francis. The radio talk show hosts hoped the new Pope would have his “Pancho” moments though. The young man on the right has always been “Lacho” to us. Horacio is just too difficult to handle. referring to them as “Concha” (for Concepcion) or “Memo” (for Guillermo) or “Pepe” (for Jose) or “Lupita” (for Guadalupe), it’s always pleasant to think you know whom they are talking about. Just before leaving Pomona, we hired a man with the name of Sergio to look after the lawn and shrubs around our house. I learned that as a boy he often worked with his grandfather in San Luis Potosi. I now wonder if they call him “Checho” at his home in California. Kate, known in Mexico as Katalina, has found her name is now shortened affectionately to “Kati”, not unlike how her friends and family have known her (but pronounced here as “kaa-ti”. Douglas has not had the joy of having his name shortened by anyone except for Kate (now writing this final paragraph.) While most of the diminuitives used by Kate for Douglas are not printable for polite conversation (not necessarily what you are thinking, dear reader! ), she has taken to usually calling him “Doog”, a shortened version of Douglas (pronounced “Doog-las” in Mexico.) Yet all the name changes appear to be a moving target, since anyone may add “ita” or “ito” to any name at any time. Alfredo Perez, Coordinator of the Mesa Conjunta (“Roundtable”), is now known as “Alfredito” to “Kati”. We had never really celebrated the March 8 International Day of Women before. But last Friday, the Iglesia Cenral in San Luis Potosi of the Discipulos de Christo in San Luis Potosi had planned a worship service and dinner afterword (a potluck) to commemorate this UN sponsored event. Kate was invited to talk about women in the USA and Mexico. In particular, the similarities and differences, opportunities and challenges of women in the two countries. The worship service was amazing! All of the speakers (a poetess read her poem written for the occasion, a magnificent sermon drawing on the witness of women in the Bible, and the testimony by Kate) were thoughtful, meaningful and dynamic. The music was beautiful and the prayers were moving. A Power Point presentation titled “Mujeres en Mexico” prepared by one of the women in the church featured women of the congregation; it was incredible! After the service, the potluck dinner fed so many and it all tasted so very good! “Women are the backbone of the church. That appears to be true no matter where the church is located-city, state or country! In the town of my birth, Atchison, Kansas, the Christian Church (Disciples of Christ) was built before 1920 and the women of the church sold baked goods (bake sales) to provide funds for the new church. Pastor Domingo Guerrero, the Superintendent of the Congregation Churches of Mexico tells how the church at Los Mochis was built thanks to tamales-made by the women of course. Women in all of North America support the projects of the church through sales of food, crafts, blessing boxes. It is the work of the women in the church that helps to keep the church active and solvent. (Not that the men don’t help in this, but today is Women’s Day, the day that we celebrate the women!) In this way, the women are very much the same in Canada, USA and Mexico. Loving God, family and church are great strengths of women in the world. One of the differences I see between women in North America is that education is stressed more heavily in the USA and Canada. This does not mean that the women there are smarter, because they are not. It means that the expectation is that women will finish high school before marriage. In Mexico, this is the hope, that women will be educated through preparatory school, but this is not what always happens. When I was growing up in Kansas, I was led to believe that I could become anyone I wanted to be. If I wanted to be a doctor, a teacher, a minister, then all I had to do was to work hard to make it happen. I was recently quite pleased to hear that a little girl in San Luis Potosi who had just turned 10 wants to be a veterinarian! I hope that wish comes true for her and I hope that many more children will dream big and see their dreams come true as well! Women in Mexico are among the hardest working people in the world! No matter the education level of the woman, she is very likely to own her own business! I walk down the street in Soledad de Graciano Sanchez and see store after store and restaurant after restaurant being run by women. Not only do they help support their families in this manner, but they work at home as well. the 1990s, women were beginning to outnumber the men there. Unfortunately, even though women were being ordained and licensed by the church, there were barriers when it came to a woman actually working as the pastor in a church. But those barriers are being overcome daily. I see the same difficulties here for women in ministry. Some churches simply do not want a female pastor. This is very sad, because I believe that women make wonderful pastors. I am encouraged by the number of women pastors in the Disciples of Christ churches in Mexico. Women have so much to bring to ministry! Look at the women participating in this service today! They organize the services in their churches and preach the word of God with meaning and gusto! I am thankful to be a woman who is serving the Church in Mexico. I will support the ministry of women in the church and beyond. Glory be to God! LAS MUJERES SON LA COLUMNA DE LA IGLESIA. ESA ES UNA VERDAD, NO IMPORTA EN DONDE ESTÉ LA IGLESIA, EN QUÉ CIUDAD, ESTADO O PAIS. EN EL PUEBLO DONDE YO NACÍ, ATCHISON, KANSAS, LA IGLESIA DISCÍPULOS DE CRISTO SE FUNDÓ ANTES DE MIL NOVECIENTOS VEINTE . Y LAS MUJERES DE LA IGLESIA VENDÍAN PASTELES Y GALLETAS PARA PROVEER FONDOS PARA LA NUEVA IGLESIA. 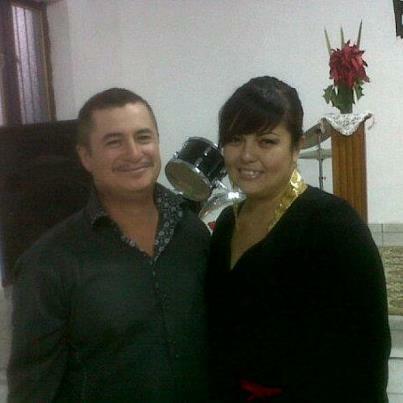 EL PASTOR DOMINGO GUERRERO, SUPERITENDENTE DE LAS IGLESIAS CONGREGACIONALES DE MEXICO, ME CUENTA QUE, COMO LA IGLESIA DE LOS MOCHIS FUÉ CONSTRUIDA VENDIENDO TAMALES HECHOS POR LAS MUJERES DE ESA IGLESIA. LAS MUJERES DE TODA AMÉRICA DEL NORTE PROVEEN PARA LOS PROYECTOS DE LA IGLESIA A TRAVÉS DE LA VENTA DE COMIDA, ARTESANÍAS Y ALCANCÍAS DE BENDICIONES. ES EL TRABAJO DE LAS MUJERES EN LA IGLESIA QUE AYUDA A LA IGLESIA A CONTINUAR ACTIVA Y SOLVENTE. (NO QUE LOS HOMBRES NO AYUDEN EN ESTO, PERO HOY ESTAMOS CELEBRANDO EL DIA DE LA MUJER.) DE ESTA MANERA, LAS MUJERES SON MUY SIMILARES EN CANADÁ, LOS ESTADOS UNIDOS Y MÉXICO. UN DIOS AMOROSO, LA FAMILIA Y LA IGLESIA SON LA MAYOR FUERZA DE LAS MUJERES EN EL MUNDO. UNA DE LAS DIFERENCIAS QUE YO VEO, ENTRE LAS MUJERES DE NORTE AMERICA ES QUE LA EDUCACIÓN SE ACENTÚA CON MAS FUERZA EN LOS ESTADOS UNIDOS Y CANADÁ. ESTO NO SIGNIFICA QUE LAS MUJERES AHÍ SEAN MAS INTELIGENTES, PORQUE NO LO SON. SIGNIFICA QUE LAS EXPECTATIVAS SON, QUE LAS MUJERES DEBEN DE TERMINAR LA PREPARATORIA ANTES DE CASARSE. EN MÉXICO, ESTO ES SOLO UNA ESPERANZA QUE LAS MUJERES TERMINEN SU PREPARATORIA, AUNQUE ESTO NO ES SIEMPRE LO QUE PASA..
CUANDO ESTABA CRECIENDO EN KANSAS, ME HICIERON CREER QUE PODÍA LLEGAR A SER CUALQUIER COSA QUE YO QUISIERA. SI YO QUERÍA SER UNA DOCTORA, UNA MAESTRA O UNA PASTORA, SOLO TENÍA QUE TRABAJAR MUY DURO PARA LLEGAR A SERLO. RECIENTEMENTE SUPE CON MUCHA ALEGRIA QUE UNA NIÑA EN SAN LUIS QUE ACABA DE CUMPLIR 10 AÑOS, QUIERE SER VETERINARIA. OJALÁ ESE DESEO SE LE CUMPLA. Y ESPERO QUE MUCHAS OTRAS NIÑAS SUEÑEN EN COSAS GRANDES Y VEAN QUE SE HAGAN REALIDAD SUS SUEÑOS. LAS MUJERES EN MEXICO ESTAN ENTRE LAS MUJERES MAS TRABAJADORAS DEL MUNDO. SIN IMPORTAR EL NIVEL DE EDUCACION DE LA MUJER, ES MUY PROBABLE QUE SEA DUEÑA DE SU PROPIO NEGOCIO. YOCAMINO POR LAS CALLES DE SOLEDAD DE GRACIANO SANCHEZ, Y VEO TIENDA TRAS TIENDA Y RESTAURANTE TRAS RESTAURANTE QUE SON REGENTEADOS POR MUJERES. NO SOLAMENTE AYUDAN A MANTENER A SUS FAMILIAS DE ESTE MODO SINO QUE TAMBIEN TRABAJAN EN SUS CASAS. ACTUALMENTE. YO VEO LAS MISMAS DIFICULTADES AQUÍ EN MEXICO PARA AQUELLAS MUJERES QUE QUIEREN SER PASTORAS. ALGUNAS IGLESIAS REALMENTE NO QUIEREN TENER MUJERES PASTORAS. ESTO ES MUY TRISTE PORQUE CREO QUE LAS MUJERES PUEDEN LLEGAR A SER UNAS MAGNÍFICAS PASTORAS. ME ALIENTA VER EL NÚMERO DE MUJERES PASTORAS EN LA IGLESIA DISCIPULOS DE CRISTO EN MEXICO. LAS MUJERES TIENEN TANTO QUE DAR AL MINISTERIO DE LA IGLESIA. NADA MAS MIREN A LAS MUJERES PARTICIPANDO EN EL SERVICIO DE ESTA NOCHE. ELLAS ORGANIZARON EL SERVICIO EN SUS IGLESIAS Y PREDICARON LA PALABRA DE DIOS CON SIGNIFICADO Y ENTUSIASMO. ESTOY AGRADECIDA DE SER UNA MUJER QUE ESTA SIRVIENDO A LA IGLESIA DE DIOS EN MEXICO Y YO APOYO EL MINISTERIO DE LAS MUJERES EN LA IGLESIA . GLORIA SEA DADA A NUESTRO DIOS. So what does the Lord require of us? Looking back on the ten day trip visiting Congregational Churches in the State of Jalisco this question seems to be a primary theme of what we experienced. 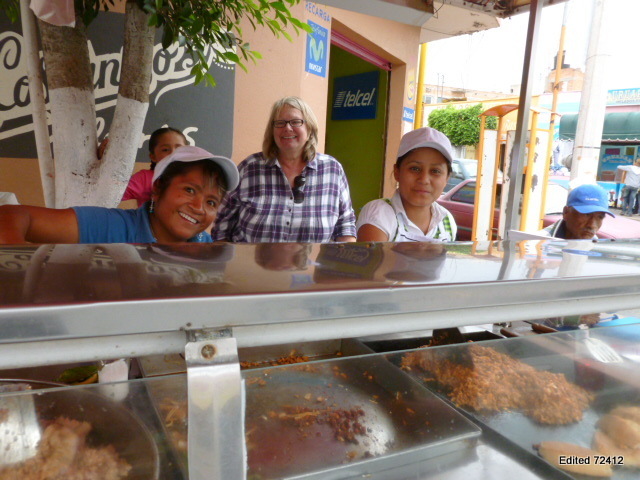 First there was the brief stop over for lunch in San Juan de los Lagos. We had no idea what we were headed for when we pulled off the four lane highway from Aguascalientes to Guadalajara in search of a restaurant. All the places on the way into town had no cars out front so we went farther. It soon felt like we were driving through the middle of the town market. Sunday afternoon strollers jammed the narrow streets lined with stalls. At an intersection, men in official looking orange vests offered help in finding parking. One of the men grabbed his bicycle and led us to a parking garage where we paid sixty pesos flat rate, twice what we had ever paid in San Luis Potosi. A cheerful attendant in the parking garage advised that we put our wallets in a front pocket. Especially in the church he said. In a search for a good place to eat we slowly made our way through the throng. Doug left Kate with the friend visiting us from the U.S. and squeezed his way within two blocks of the central plaza and cathedral. A policeman informed him that yes it was this crowded every Saturday and that on February 2 there had been twice as many people. We were glad we were two Sundays late. making our way out of San Juan de los Lagos and back to the highway. 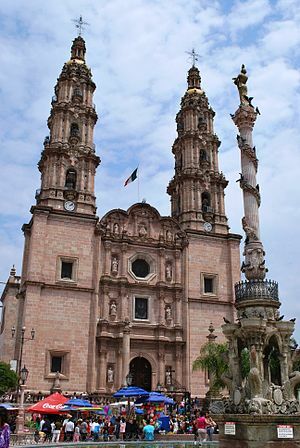 Our friend consulted his down loaded guide book as we drove to Guadalajara and read that we had just visited the second most visited Catholic shrine in Mexico. The image of the Virgin Mary in the town’s cathedral is visited by 7 to 9 million people yearly; that means over five per cent of the country’s population make the pilgrimage, most on a week end during the year. That explained the half dozen signs on the highway to San Juan de los Lagos warning drivers to take caution for the “pilgrims” along the roadway. Friends later told us that pedestrian fatalities occur often on that stretch of highway. 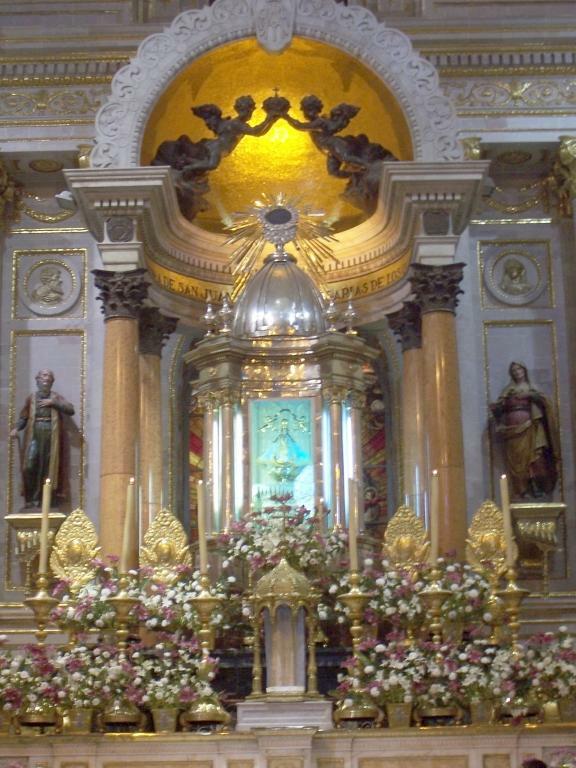 The Virgin image housed in the San Juan cathedral is credited with saving or protecting the faithful from mortal danger. In a country now gripped by concerns over insecurity and violence, the renown of the Virgin’s image may well have grown. Two days later we heard about a very different experience of the Holy Spirit. The young pastor of the Ahualulco Congregational Church was giving his testimony about leaving a life of drinking and debauchery for one of service. He was living in California at the time, picking crops throughout the State, and on a drinking spree one night in San Jose. Walking through a city park, he suddenly felt a knife pointed at his neck while the friend next to him had a gun barrel at his head. Instantly the pleas of his sister to accept Jesus Christ as his personal savior came to his mind. He handed over the forty dollars in his pocket and although the friend had no money, their attackers let them go unharmed. Young Octavio Reyes Moya felt he had been given a second chance to make something better out of his life and he began going to church before returning to Mexico a changed man. 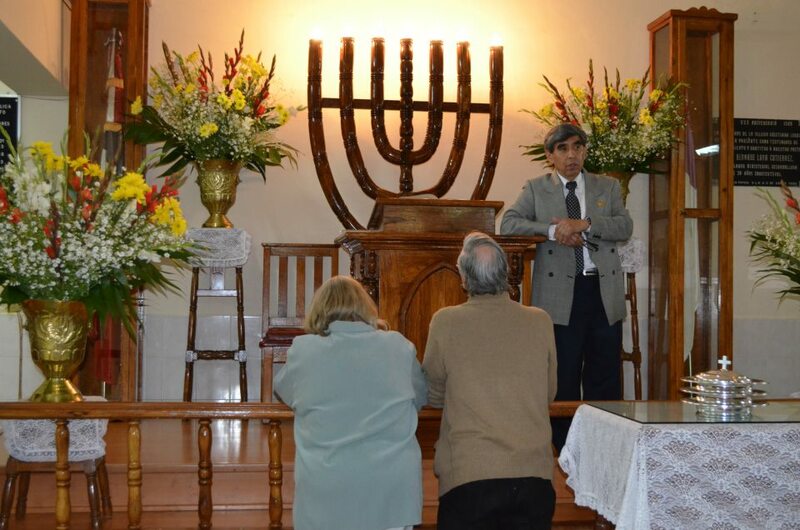 A church in a small village near his hometown needed a pastor and five years later he began to pastor the Congregational Church in the larger town of Ahualulco as well. Compensating for his lack of seminary training with a sweet spirit and firm dedication to pastoring the two congregations, Octavio kept highlighting the “sacrifice” Kate and I were making in leaving our country and our language to serve alongside him and other pastors in Mexico. In his eyes, his service in our country as an undocumented farmworker had been more than compensated for by finding his true vocation in “el norte”. 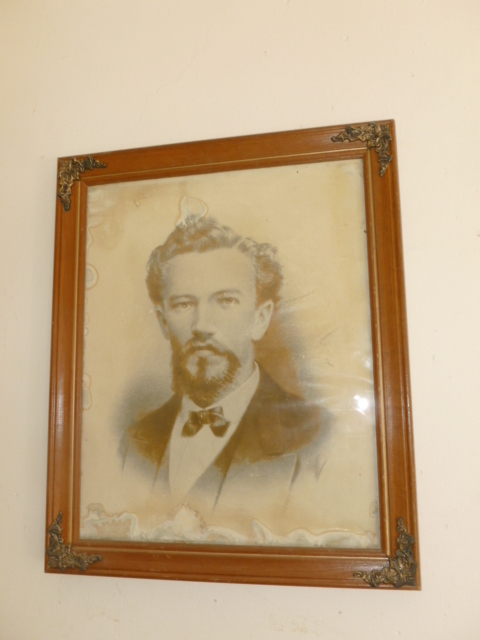 A chapel and plaque in Octavio’s church honors the memory of the young Congregational church missionary from the States who was killed in Ahualulco in the 1870’s. John Stephens died alongside his friend and Ahualulco neighbor Jesus Islas while serving what is now perhaps the oldest Protestant church in Mexico. 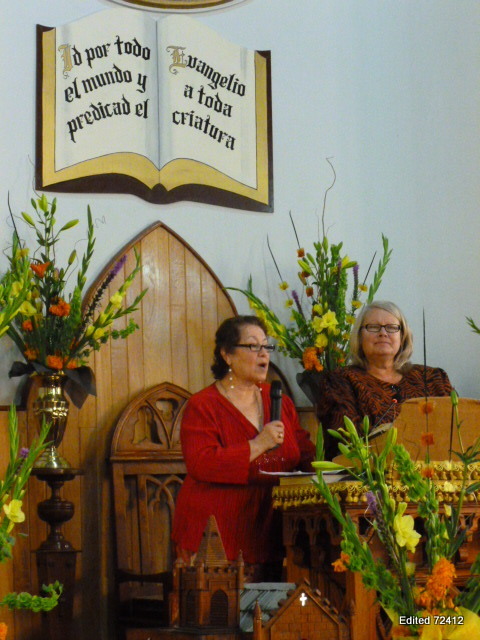 Funds for the chapel and plaque were donated by the Pacific School of Religion in the Bay area to commemorate the sacrifice of a PSR alum’s life to propagation of an evangelical faith in Mexico. evangelicals have an advantage over Protestants in the U.S. in embracing this aspect of our “call” as Christians. As a minority in a heavily Catholic country, many have had to take a risk in embracing the minority faith journey. They have learned that faith is not about making life easier. It is rather about making life richer and more meaningful and, yes, taking risks from time to time. We are grateful to have been reminded in a new and different way of “what the Lord requires”. 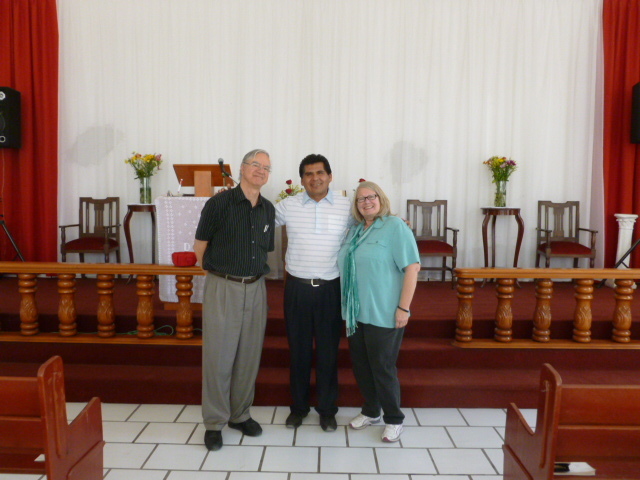 See our gallery below of selected photos from our visits of Congregational churches in Jalisco, the longest trip we have taken here. Stone balls, all of this size, are on display in Ahualulco. Are they volcanic or man made? Pastor Domingo Guerrero, leader of the Mexican Congregational Churches speaks with Endendenia and one of her 4 children. Six months ago Endie was deported from Phoenix with her husband and the children who were all born in the U.S.
Benito and Socorro Contreras of Tjajamulco Congregational Church with their daughters. Two years ago, Benito became the first member of his parents’ family to adopt the evangelical Protestant faith. Irma Torres Gutierrez of the Tlajomulco Congregational Church was the second woman to be ordained by the denomination some 25 years ago. Mesa Conjunta – “Roundtable” – meeting of the Congregational and Disciples leaders, body which guides our work here. 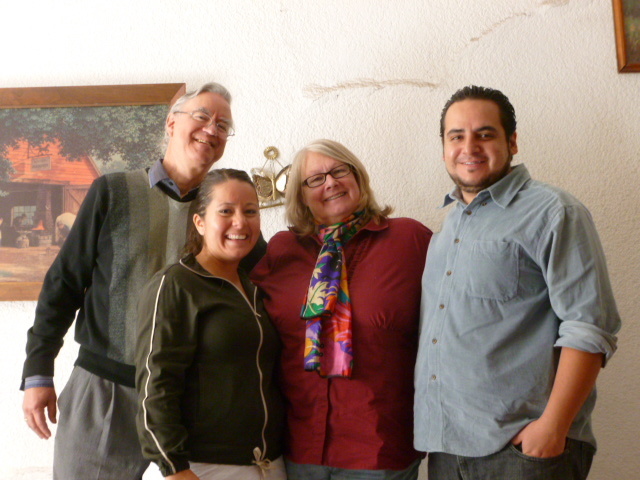 Mesa Conjunta member Ana Yolanda Gutierrez (r.) hosted us in Guadalajara. 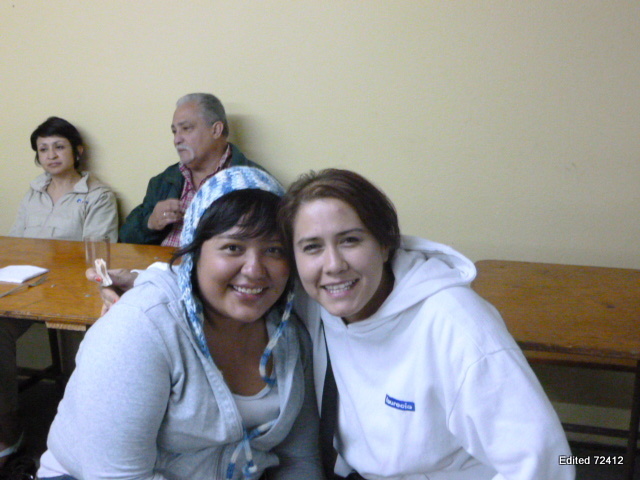 Her niece Laura (l.) served with Disciples in Paraguay for 8 years.